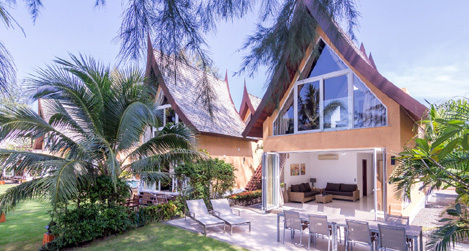 All our thai style villas are located in the Lagoona section of the Siam Royal View resort, just 5 minutes from the ferry pier to the mainland. 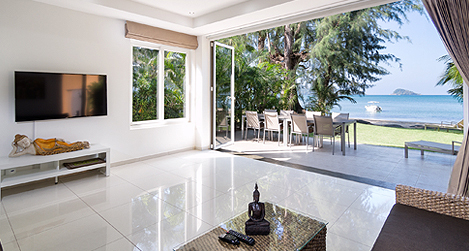 Two sea view villas 4D and 4E are situated in the first line of the beach houses, with spectacular evening sunsets over the bay, right on the stunning Chang Noi beach, large quite white sand bay with sparkling sea. Splendid sunrise over naturally green mountains and great golf laguna view, is offered by new luxury villas 63A and 62F, both with private swimming pool and 45m distance to the Chang Noi beach. Moreover, by those, who like combination of relax and active life, equipped gym in the villa 62F can be used. All villas are comfortable, spacious and provide full comfort of completely furnished houses to relax and enjoy your holiday stay.The resort is surrounded by mountains with rain forest. The place is very peaceful and romantic, just ideal stay for couples and honeymooners, family with children will also enjoy this lovely dream place. 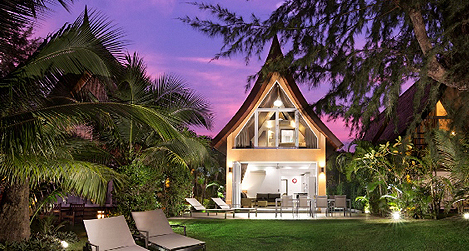 The Siam Royal View resort in which the villa is situated in, offers two restaurants, a club house, a marina pub, two large public swimming pools and a 9 hole golf course. There are also plenty of glorious places ( fishing villages Bang Bao, mountainous backrops with waterfalls Klong Plu, Thanmayon, tropical rainforests) to visit outside the resort and those who like adventures can enjoy activities like kayaking, snorkeling, fishing, boat trips and cruises, hiking and jungle trekking, or elephant riding. Those who like relay and rejuvenate can experienced many resort spa facilities and beauty treatments.